Eugene Delacroix. 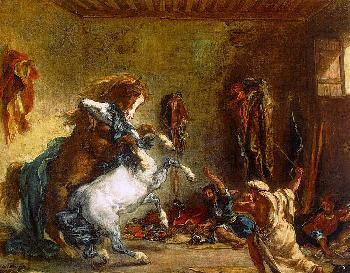 "Arab Horses Fighting in a Stable"
Romanticism in art history existed roughly between 1750 and 1850, between realist and neoclassical art. This new spirit elevated emotion over reason. Spontaneity was desired over control, and the senses were desired above analytical thought. Famous artists of this period were interested in mystery, and the sublime, man against man and man against nature as exhibited in one Delacroix's famous paintings, "Massacre at Chios". Romanticism art was a reaction to the strict compositional art order developed by Jacques Louis David in the period of neoclassical painting. Those who followed this new thought had a desire to be free of the constraints in systematic thought. Emotion and imagination were put on a higher plane than reason. In reaction to neoclassical rules established by the art paintings of David, artists gravitated to the new found freedom of emotional expression. Nature in its wild, unbounded state was a perfect match for the new style. To those painters following the new trend nature was irregular, a structure full of primitiveness and wild accidental happenings. Nature in the raw struck a nerve in the in these artists and stoked creative imaginations. Contemporary thought didn't limit itself singularly to images of beauty either. The emotionalism of the sublime caused an interest in adventure, an interest in things grotesque and also things in the spiritual realm. The term Romanticism" in art originated toward the end of the eighteenth century distinguishing contemporary thought from that of Neoclassicist thinking. The term was a state of mind relying on an individual's feelings rather than on considered thought. The attraction for the artist was its independence and freedom for individualistic expression. This period of Romanticism in art history isn't one particular style, but a number of styles, because to understand the word during the last part of the eighteenth century, is to understand it was unique vision to each person individually.